Traditional or modern, classic or retro, you’ll find beautiful sofas in all kinds of styles and fabrics here. Luxurious leather sofas, classic fabric sofas, big comfy corner sofas, versatile sofa beds...choose the look that fits your room. Is your heart set on a designer chair to complete the look? 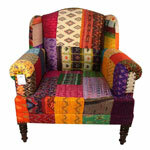 At Tulika Handicrafts you can find a fantastic range of designer chairs.